The long anticipated Avengers: Infinity War has finally arrived, and everyone is definitely here for it. The movie starts off as a continuation for the end-credit scene of Thor: Ragnorok on a spaceship with Loki (Tom Hiddleston) and Thor (Chris Hemsworth) facing Thanos (Josh Brolin), the main villain throughout the whole movie, and his crew. This beginning scene is very important because it reveals Thanos’s intentions. This scene later leads Thor to the Guardians of the Galaxy, who partner up throughout the movie. Unlike the first two Avengers movies, Infinity War has a lot of characters to keep up with, which for me was a little difficult but definitely made the storyline more interesting. In a lot of scenes, for example the beginning that I mentioned earlier, some dialogue is a bit confusing and only makes sense if prior Marvel movies have been seen. All of these characters, of course, have their own movies like Doctor Strange, Guardians of the Galaxy (Vol. 1 and 2), Iron man (1-3) Captain America (1-3), Black Panther and Spider-Man: Homecoming. For ten years these movies came out in a specific order to lead up to Infinity War, which is why this movie had such a suspenseful wait. In my opinion the plot was very interesting; there were many twists and exciting moments. The characters were portrayed greatly, from Iron Man’s hubris to Groot’s sassy comments as a moody teenager. There were definitely scenes that kept me on the edge of my seat as well as lighthearted humor to balance out the sadder and serious scenes where characters showed their internal conflicts and split second, important decisions. As a whole, the movie was a roller coaster of emotions. Especially the shocking way in which the movie ended and the unbelievable cliffhanger. Avengers: Infinity War earned $258.2 million in its first weekend, setting the bar even higher as Star Wars: The Force Awakens was $248 million on its opening weekend. According to Fandango, over 1,000 show times were sold out. This action-packed movie is a definite must-see with friends and maybe even family (though not with younger siblings if they get scared of fighting scenes). 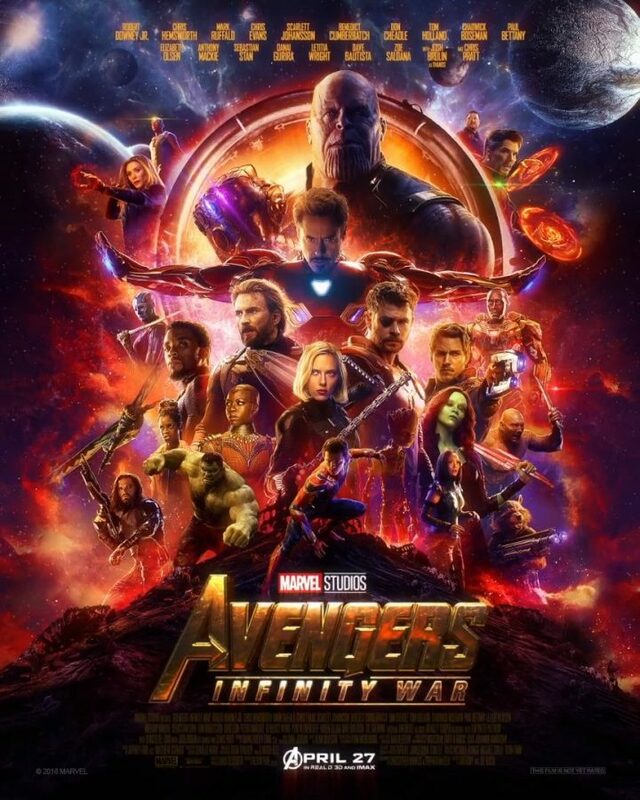 I give Avengers: Infinity War five out of five paws because the movie was pretty consistent with past Marvel movies and their timelines, had a very interesting plot and aside with the abundant amount of characters, not too hard to keep up with.